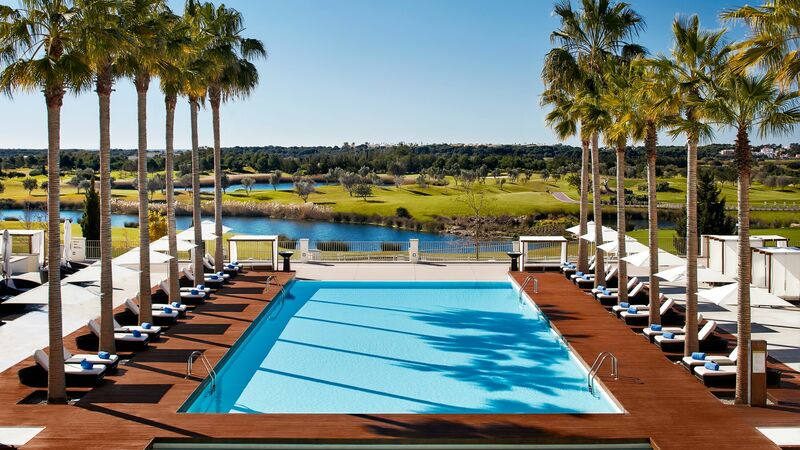 Anantara Vilamoura Algarve Resort is a contemporary and elegant 5-star resort sat on the edge of the picturesque Victoria Golf Course. 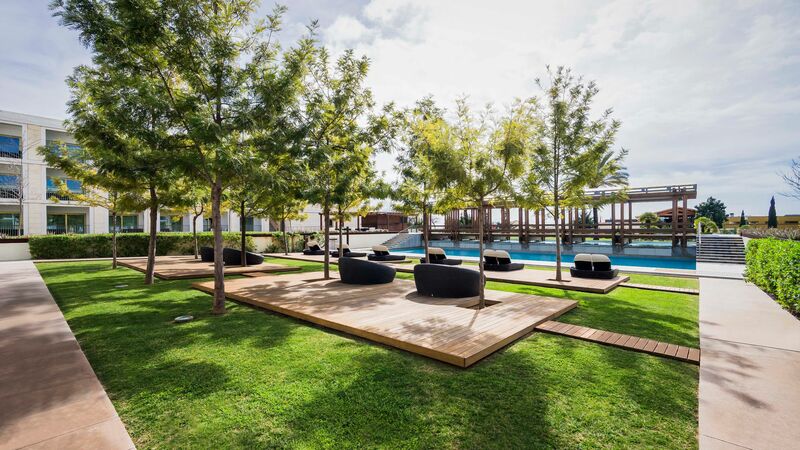 Surrounded by the rolling hillside of the Algarve, this resort offers the perfect getaway. 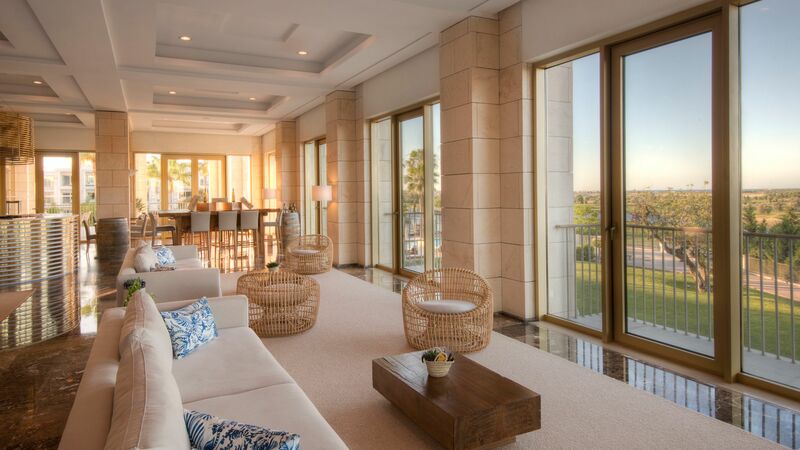 Rooms boast floor-to-ceiling windows, providing stunning views of the grounds below. Guests are sure to enjoy the luxuries their room provides, such as a balcony, an excellent coffee machine, a mini bar, and a rain shower. 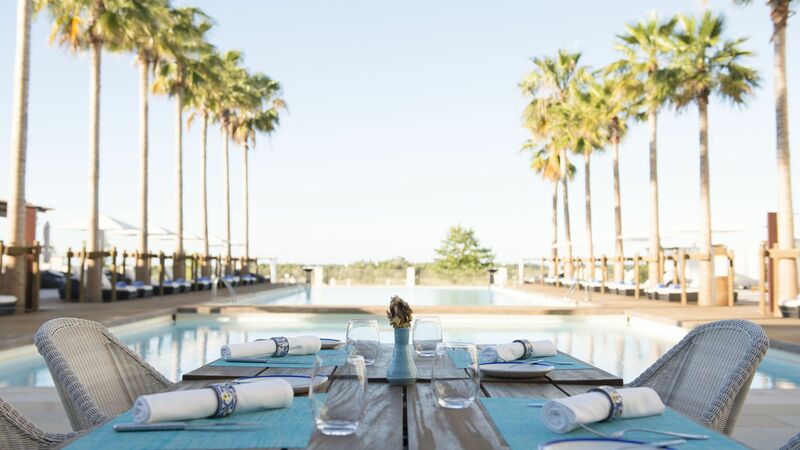 Fresh seafood, afternoon tea, tapas, traditional Portuguese cuisine, and gourmet buffets are all part of the wide range of dining experiences on offer at Anantara Vilamoura. Guests can opt to relax under a shady cabana with a glass of champagne or join the Spice Spoons traditional Portuguese cooking class. 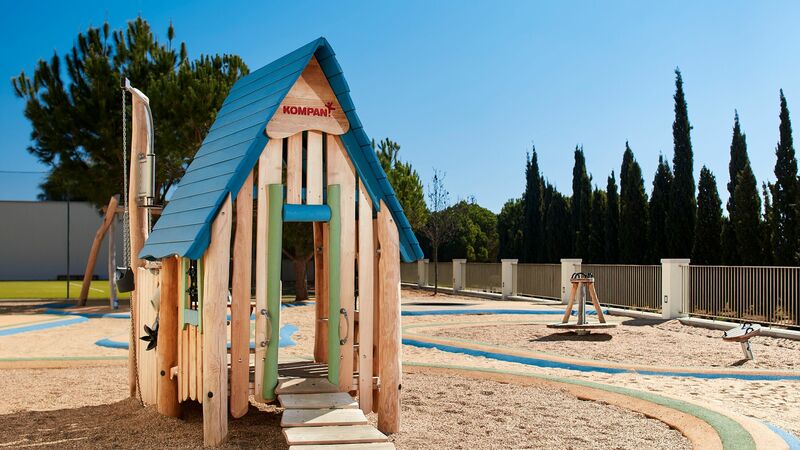 Anantara Vilamoura is perfect for families, with personalised meals for children, clubs for kids and teenagers and babysitting available 24 hours a day. Those wishing to escape can head to the adults-only pool for a peaceful experience, or relax at the award-winning spa. The hotel is situated near the town Vilamoura, which guests can visit to enjoy the vibrant marina, gourmet restaurants and chic bars. The beaches of Vilamoura boast soft sand and crystal waters and are perfect for families. Hotel child prices apply to ages 3–12 years. 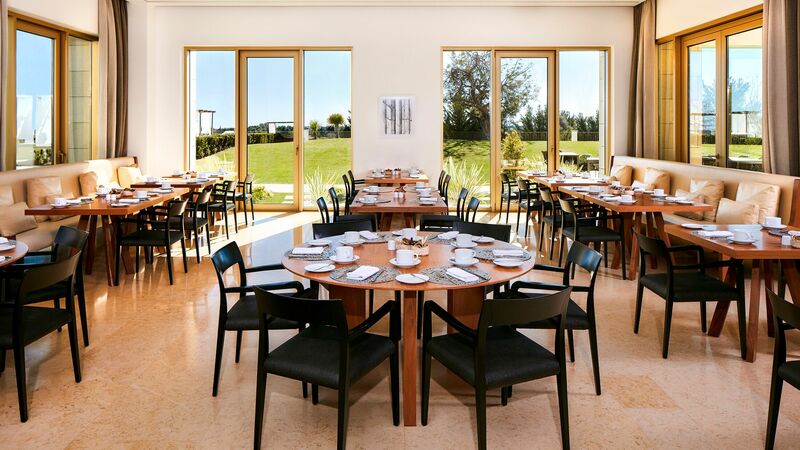 Offering delicious Portuguese cuisine designed by the executive chef, Emo is a modern, minimalist restaurant with a terrace overlooking the golf course. Guests on Half Board and Full Board can receive €25 credit per guest to be deducted from the bill. Each morning, fresh catches are presented for guests to select and pre-order for lunch. Guests can dine inside, on the terrace or even have their lunch brought to their sunlounger. Guests on Full Board will receive lunch at this restaurant. Enjoy breakfast with freshly baked goods, freshly squeezed juice and premium coffees. Come back for dinner for live cooking stations and an international themed buffet prepared with local ingredients. Guests on Half Board and Full Board will dine at this restaurant. Sit back and relax on your sunlounger while butlers provide refreshing drinks, gourmet snacks and light lunches. Or, retreat to your cabana and enjoy a chilled glass of champagne. Lounge in comfort in this contemporary bar.Taste teas while reading from the library section, or enjoy afternoon tea, tapas or signature cocktails overlooking an exquisite view of the grounds. Exclusive to adults at the adults-only pool, this bar serves a tasty selection of snacks and refreshing drinks in a tranquil, peaceful setting. 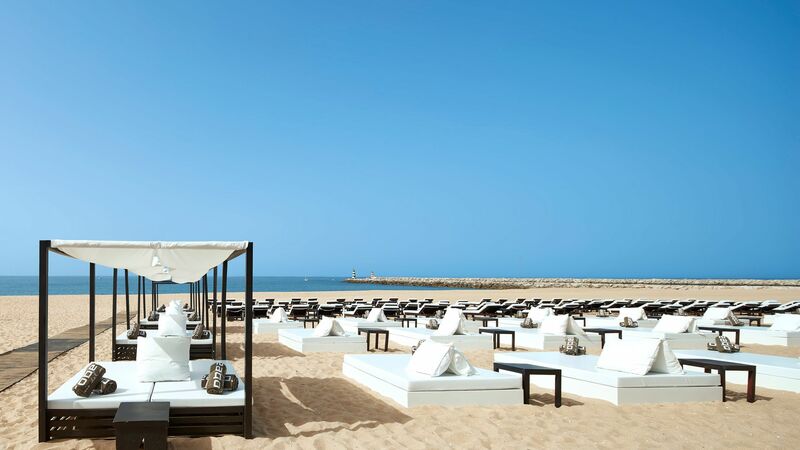 Guests wanting to relax at the beach can find themselves at Purobeach Vilamoura via a complimentary daily shuttle service. Enjoy a cocktail on a sunlounger while overlooking the Atlantic ocean. Sunbathe by three outdoor pools - one exclusive to adults and one catered for children. Guests staying in one of the hotel's suites can enjoy the indoor heated pool. Kids will be entertained all day with arts and crafts, sports, fun games and an exciting playroom at the kids club. Babysitting is also available around the clock. 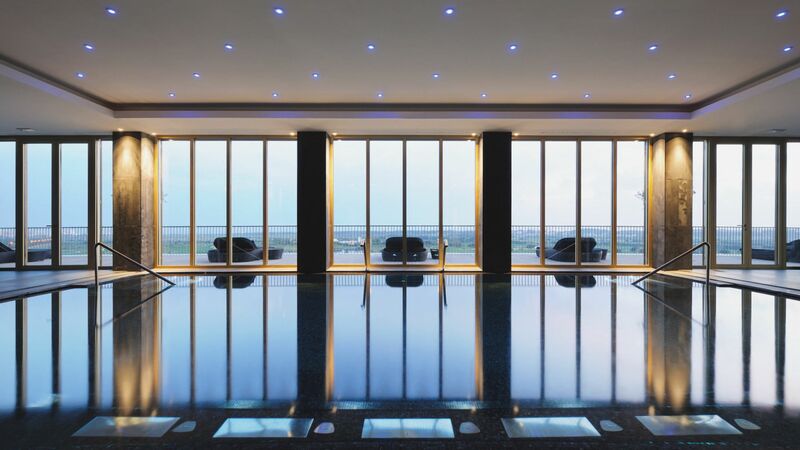 Anantara Spa Vilamoura provides award-winning luxury by combining Mediterranean therapies and Thai techniques. Indulge in 6 treatment rooms, a sauna and a steam room and leave feeling relaxed and rejuvenated. 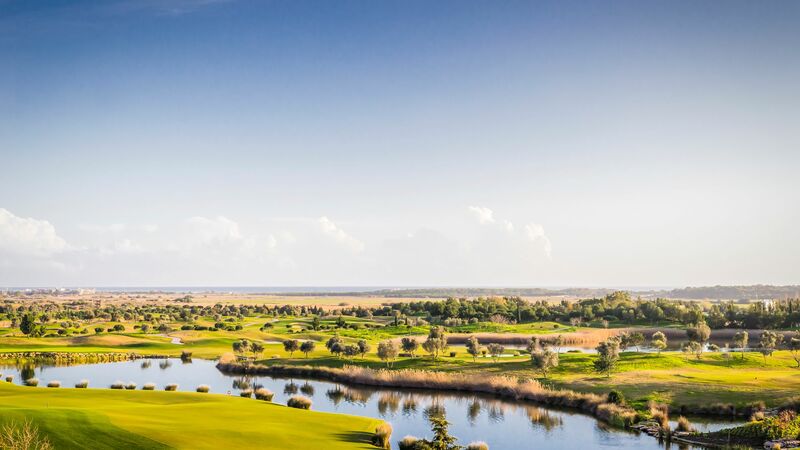 Anantara Vilamoura is privileged to be right on the doorstep of some of Europe’s most prestigious golf courses. Guests can make use of private transfer to and from courses. 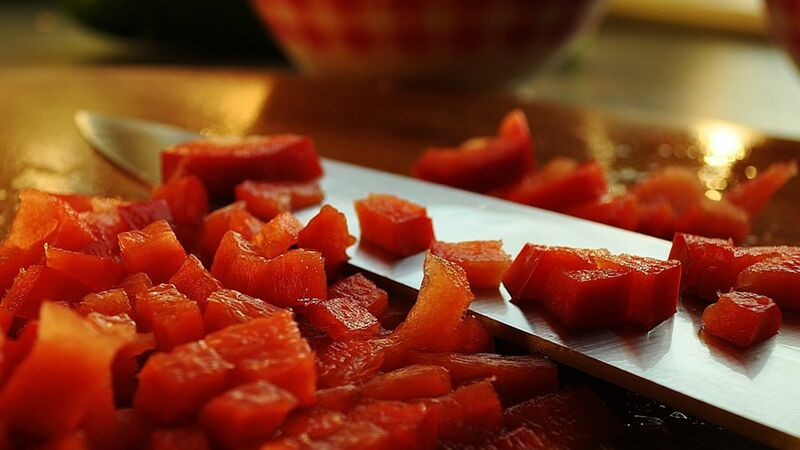 Explore the famous Loule food market before heading back to the open theatre kitchen to learn traditional Portuguese cooking techniques. Please note classes must be booked 24 hours in advance. Tennis lovers can head to the hotel’s outdoor tennis court to stay active during their stay. Revitalise your mind and body at a yoga or tai chi. Lessons are held on a beautiful terrace overlooking the resort grounds. 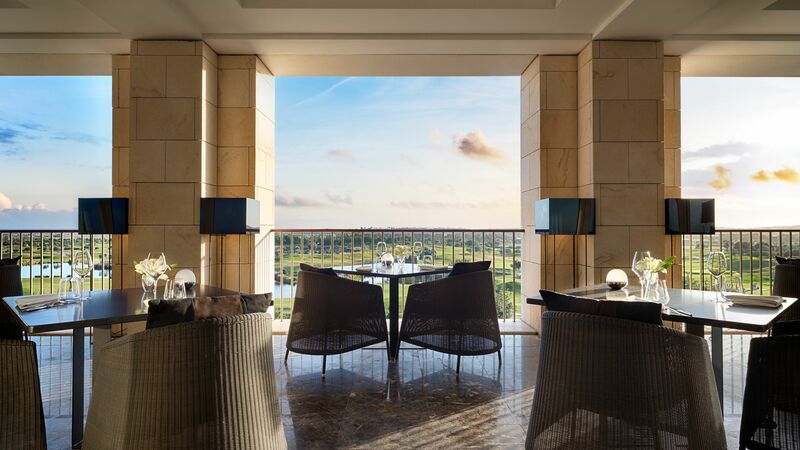 Located in a quiet area of Vilamoura, along the southern coast of Portugal, Anantara Vilamoura Algarve Resort is ideally placed for those wanting to explore the best of the Algarve. The golden sands of the beach are a 10 minute drive away and offer plenty of space where you can stretch out, as well as water sports and activities for more active visitors. If you prefer to stick to dry land tennis, horse riding and a spectacular array of famous golf courses are available in the surrounding area. Head into the heart of Vilamoura and you’ll find colourful houses and pretty streets filled with cafés, tavernas and restaurants. The marina area is full of luxury yachts and upmarket eateries, as well as boutique shops and lots more. 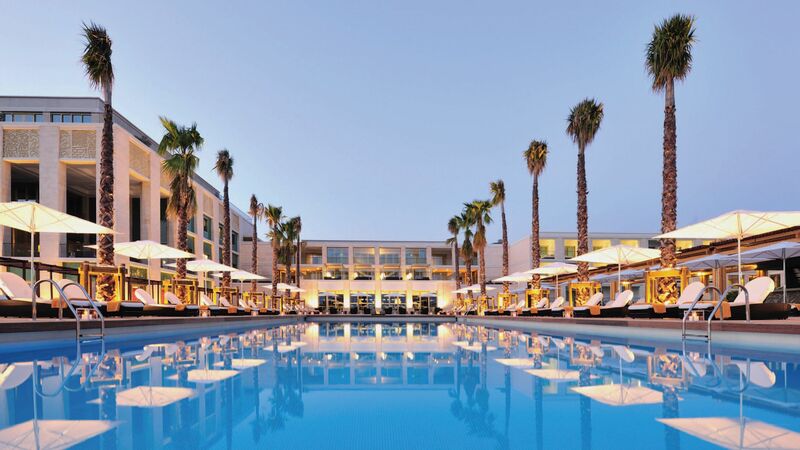 Anantara Vilamoura Algarve Resort is a 35 minute drive from Faro Airport. Twin Deluxe rooms are comfortably furnished and feature either a double or twin beds, a bathroom with a bathtub and a separate rain shower as well as a private balcony with a cozy daybed. Twin Deluxe Garden View Rooms are comfortably furnished and feature either a double or twin beds, a bathroom with a bathtub and a separate rain shower as well as a private balcony with a cozy daybed and views over the gardens. Twin Deluxe Pool View Rooms offer a spacious accommodation featuring either a double or twin beds, large bathroom with a bathtub and a separate rain shower as well as private balcony with a daybed and views over the swimming pool. Twin Deluxe Golf View Rooms are comfortable and spacious and feature either a double or twin beds, bathroom with a bathtub and a separate rain shower as well as private balcony with a daybed and views over the golf course. Ideal for families that need additional space, Family Rooms consist of two Deluxe Rooms with either a garden, pool or sea view and an internal door. The spacious Junior Suites feature a bedroom with double bed and a large sitting area separated by a sliding door, bathroom with a bathtub and a separate rain shower and a private balcony with a daybed and lovely views over the golf course. Guests staying in a Junior Suite also have use of a butler service to take care of special requests. One Bedroom Suites feature a double bed, private balcony with daybed, two walk-in wardrobes, lounge area with sofabed, bathroom with rain shower and bathtub and a guest bathroom. These Suites also benefit from a 24 hour butler service. Save up to 25% discount on the hotel price for holidays between 01 April - 30 June 2019, 01 September - 31 October 2019, save 35% discount between 01- 15 July 2019, 26 - 31 August 2019 or save up to 30% for stays between 16 July - 25 August 2019 booked by 30 April 2019. Up to two children between 0 - 12 years old eat free when parents book half board for holidays until 31 October 2019 (excludes Christmas, New Year, July and August). Guests staying in a Golf Suite, Family Suite and Victoria Suite receive up to 25€ resort credit per person per night for holidays between 01 November 2018 - 31 October 2019 (offer is not combinable with half board). Guests receive up to 20% discount on Spa treatments when staying in a Family Room, Golf Suite, Family Suite or in a Victoria Suite for holidays between 01 November 2018 - 31 October 2019. Guests staying at the Anantara Vilamoura receive free access to the Purobeach for holidays between 01 November 2018 - 31 October 2019. Guests staying in a Victoria Suite has access to a Veuve Cllicquot Cabana for holidays between 01 November 2018 - 31 October 2019. Guests staying in a Golf Suite or in a Victoria Suite receive free access to Vitality Pool and Spa facilities for holidays between 01 November 2018 – 31 October 2019. We stayed as a couple in Feb 2019 for our anniversary. Really lovely hotel, very friendly helpful staff from reception to concierge to restaurant staff. Luxury Elemis products in the room. For our anniversary the hotel arranged fruits and chocolates to be sent to the room. We went to the Spa a couple of times - although expensive it was definitely worth it. The gym facilities are also good. I was pleased to see the hotel offered good vegetarian and vegan food options in the bar since I am vegetarian- this was important to me. We had the most amazing and romantic break. Staff were very pleasant and helpful throughout our stay. We received a special surprise in our room of champagne and chocolates to congratulate us on our wedding. Shuttle was prompt and drivers very friendly. Hotel also arranged car rental for us and this was the icing on the cake because we were able to explore different places. Will definitely stay in this hotel again. The following are indications of what one can expect at this hotel 1. Should a five star hotel allow guests to lay around in the foyer area with their bare feet resting on sofa's and chairs ? None of the staff seemed to be bothered !! 2. Totally chaotic breakfast...lots of staff but all running around like headless chickens...5 star ? 3. The hotel was unable to organise a golf package which I ended up cancelling which ruined my holiday 5 star ? ?